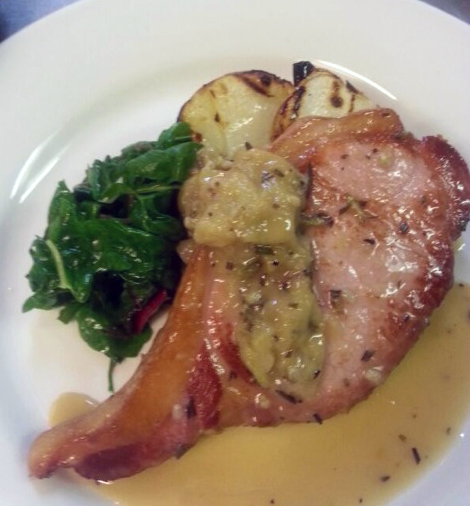 The cider, thyme and lightly cooked gooseberry sauce gives a light and summery edge to a bacon chop. Thanks to the Head Chef Ugo at local gastropub The Sun Inn, Dedham for this recipe. See his delicious blackcurrant focaccia too. Brown the chop on both sides, add the gooseberries, cider and thyme. Cover and leave to cook on the hob for 10 – 15 mins on a low heat. The gooseberries should ‘melt’ and make their own sauce. Check the seasoning and add a touch of sugar if desired – it should have a resemblance of apple sauce in tartness. Serve immediately, with griddled new potatoes and wilted chard (see below). Blanch in a pan of salted water until cooked – allow to cool slightly then cut in half lengthways. Drizzle with olive oil and season, then chargrill on a griddle pan until you have nice charred lines of crispness. Turn once and serve. Select a handful of ruby or rainbow chard. Separate stalks and leaves, cut stalks into 3cm diagonals. Blanch for 1 – 2 mins, add leaves and blanch a further 1 minute. Strain. Saute in a knob of butter with half a garlic clove minced and season.